A friend advised me to shoot with “unity gain” on the ASI071MC Pro, namely gain = 90 and offset = 65. 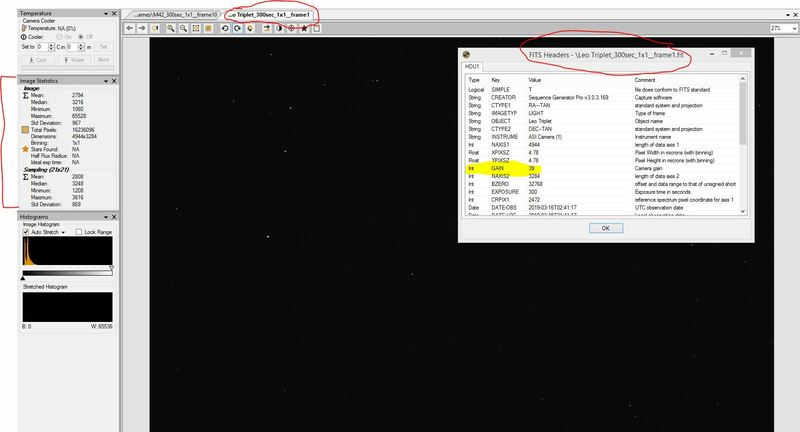 I tried that, but there is so little signal in the FITS light files, even after 300 seconds on a bright target like the Orion Nebula, that PixInsight can’t find any stars for registration. This is my first go with CMOS for deep sky imaging (and with SGP). I am used to DSLR. I understand that gain is essentially ISO. More gain is more signal boost. Not really sure what offset is? Also not sure what a good starting point is for gain and offset for general deep sky imaging, and whether I should be using the native ZWO drivers in SGP or something more generic? I have the ASI071MC and I am satisfied with the sensitivity with the camera. I can even get enough photons with narrowband filters with a 300s frame. I use unity gain most of the time. Something can be off in your imaging train. Can you give more info which telescope, f-ratio and filter you were using. I am using a Skywatcher Esprit 80ED apochromatic refractor. 80 mm aperture, 400 mm FL (f/5). I also use Skwatcher’s flattener (no focal length reduction, just a flattener) as well as an Hutech LPS-D1 light pollution filter. This is basically the same setup I used with my modified Canon T2i DSLR. I put some of the light frames, etc.in the Google Drive folder shown below. Check out the Leo Triplet shot and associated FITS info from a few days ago - less gain, but way more image signal. I really don’t understand that - especially for a target like M42. I also added a link to my Astrobin site to give you and idea of the gear I use as well as other photos I have done over the years. To visualize this better, I added some screenshots. Basic question: how is it possible that for a 300 second exposure of a bright object like M42, I get near zero signal with a gain of 90 but for a 300 second exposure of the Leo Triplet, I get a lot more signal at a gain of 39 ??? Both screenshots here show the unstretched FITS file. Again, I am new to SGP. Since SGP applies a small stretch to FITS images as the roll in (nice feature) I did not think to look at the histogram or image statistcs. Also, since the Leo Triplet light files came out nicely the day before - at a lower gain - I really was shocked to see such low signal level in the FITS. PI can’t find any stars on these FITS (neither can DSS). 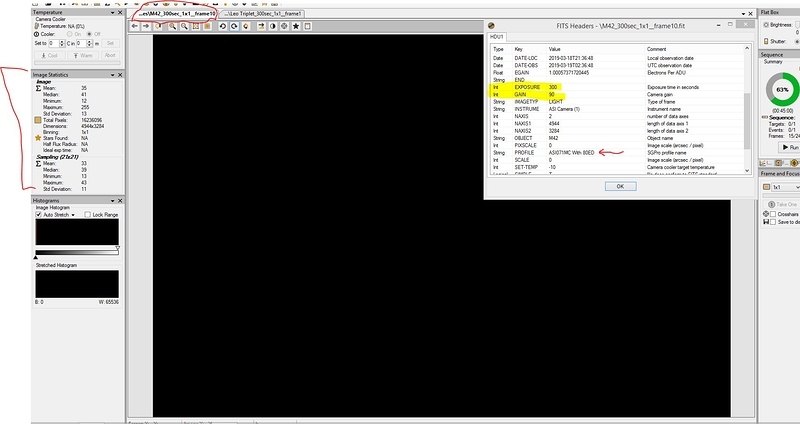 Only difference in the FITS header info (other than date, time, and target name) was the “Profile”. Leo Triplet did not have a profile associated with it. I am thinking that I must be missing something simple here. Your Leo Triplet is pretty dim due to possibly short sub-exposure times or low gain setting. M42 is significantly brighter than Leo Triplet. Your M42 data looks great. You need to first deBayer the sub in order to convert to color. I used PixInsight and used RGGB deBayer pattern to convert to color. Then you need to stretch the image by using ScreenTransferFunction (STF) by clicking on radioactive button. It will most likely show green background and that’s normal because the R, G, B channels are not properly “linked”. Finally click on the “chain link” button and then radioactive button to properly link RGB channels to show proper color. The rest of the processing can be discussed in another thread. Like I said before, Leo Triplet is much dimmer than M42. Either increase sub-exposure times or gain. You have to remember that SGP is NOT a processing software. I notice you are using PixInsight software and it’s one of the best processing software but it also has some learning curve. Thanks to both of you for your help and insights.